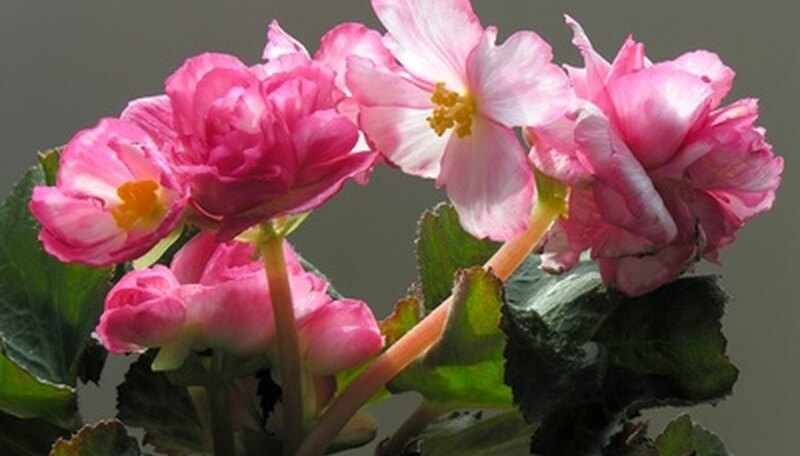 Begonias come in over 1,500 species and thousands of cultivars. This makes choosing the plant you want to grow more difficult than growing it. The plants are perennial although many gardeners in very cold areas grow them as annuals, as they brighten up gardens, flower beds and landscapes all summer long. The bronze leaf type accent any flower color with bronze and green leaves. The bronze leaves may make the plants a little less sensitive to the sun, but all begonias should be planted in partial shade to look their best. Choose a location that has morning sun and afternoon shade. The location should drain well or a raised bed can be made for the begonias. Plan planting for spring when all threat of frost is passed. Using a flat head shovel, remove the top layer of lawn grass and weeds from the chosen area for the begonias. Place 2 inches of compost, such as a leaf mold or humus, on top of the soil bed. Work the compost into the soil by digging to a depth of 6 inches and turning the soil over several times. Rake the bed out smooth. Dig holes in the bed the diameter and depth of the containers you purchased the plants in. Spacing should be 6 inches apart as they will fill in the area as they grow. Remove the plants from the containers and place in the planting holes. Press the soil down firmly around the roots. Water the soil thoroughly after planting. Water to keep the soil moist for the first week and then cut back watering to when the soil feels dry. Begonias will do better a little dry than overwatered. Water in the early morning so the foliage has time to dry. Hold back watering throughout the winter. Hand pull any weeds until the plants fill in the bed. Once filled in there will be too much shade for the weeds to grow. Fertilize with a slow release granular fertilizer once there is growth. Follow manufacturer’s directions on amount and how often to apply. Bronze leaf begonias also make great container, window box and hanging basket plants.